Take a look in your closet and ask yourself how many articles with stripes do you see? I have four shirts and a drawer filled with striped socks that are all missing their twin. It basically is the bread and butter of fashion design; it is one of the few patterns a 2-year-old and an 80-year-old share and is worn by all sexual orientations in all dress styles. From casually walking your dog in the park to an elite black-tie affair – you can never go wrong with stripes. Which begs the question – how did this zebra-like pattern become part of everyone’s closet in the first place? The funny thing about our popular striped pattern is that there was a time in the Middle Ages that it was considered a perilous act. Only the social outcasts, such as prostitutes, jugglers, cripples, and clowns wore the pattern because it is highly distinguishable. Local archives even say that in 1310 Northern France, a cobbler was condemned to death for simply being spotted wearing the pattern. Stripes were even deemed ‘the devil’s cloth’ since captured convicts would wear the pattern as uniforms which could be easily spotted and identified if he happened to escape. However, many American states decided to abolish the uniform in as early as the 20th century as it was seen as a badge of shame. This pattern remains an active archetype in what we believe prisoners are wearing which is dominated in popular media. Consider Johnny Cash’s famous lyrics from his song ‘I Got Stripes’ which truly demonstrates how much of a burden this pattern had. So when did the switch occur where this pattern went from a fashion nightmare to fashion style? The 1783 American Revolution called for a flag designed which included 13 red and white stripes to demonstrate the 13 British colonies that fought for freedom and a rebirth from England’s power. The stripe also had already become a symbol of the 1789 French Revolution in the folded rosette worn on their hats displaying the colours red, white and blue intertwined together to signify military honours. However, it was when Queen Victoria dressed her son Albert in a sailor suit to board the Royal Yacht in 1846 that this fashion style took a popular turn in the fashion world. Sailors had been wearing these horizontally striped uniforms for multiple reasons, firstly it was easy to spot shipmates who had fallen overboard. They were easy to put on quickly, due to the fact that they were buttonless and they symbolized an inferior status to their captain and lead officers. Aristocrats had begun to wear vertical stripes to represent their superiority since it carried status-enhancing value, however by Queen Victoria’s son wearing this striped uniform, the connotative lines were blurred between horizontal and vertical stripes. This also created the image that stripes had a youthful and playful meaning in which all of society wanted to display, although children particularly changed the stripe into having a positive intention. Fashion designer Gabrielle ‘Coco’ Chanel was on holiday in the northern coast of France when she fell in love with uniforms the sailors were wearing. 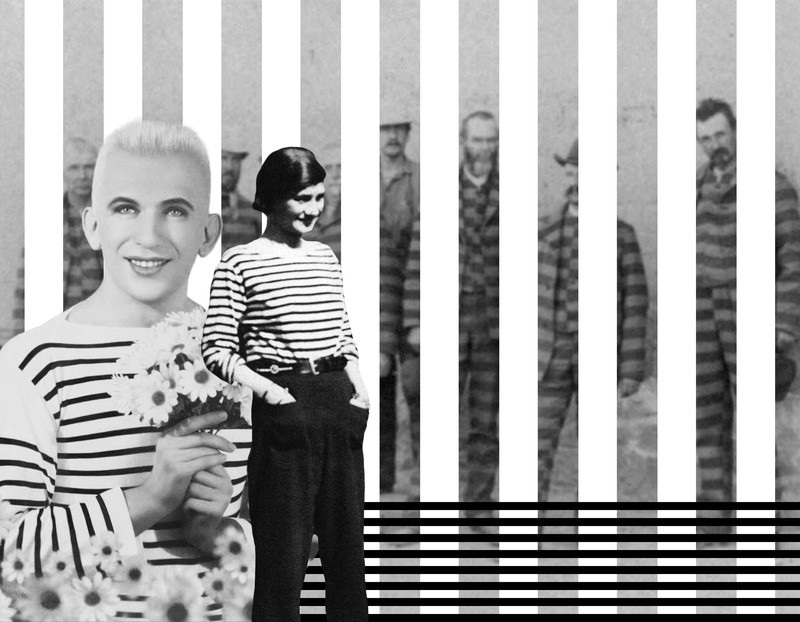 They inspired her to create her minimalistic 1917 nautical-themed collection; she is credited for designing the official popular Breton top, 2-inches of white stripes and then a 1-inch navy stripe. It is called the ‘Breton’ top after those Breton sailors, who wore the top with 21 stripes to symbolize each of Napoleon’s victories for all French navy men. She designed the loose fitting shirt to be worn with wide-legged trousers to empower her female audience. Celebrities like Marilyn Monroe and Audrey Hepburn put this fashion style on the map. Her Breton shirt was adopted by first the upper class but was worn by almost all social class later into the 20th century. With the rise of the Beach Culture striped beach clothing was predominant in the mid 19th century. From women’s beach dresses to tents and men’s bathing suits everything was striped. As the beach destination became slowly more accessible to all wealth classes, the lower class would adopt the upper class styles and stripes at the beach was seen as chic. This popular pattern slowed down in the ‘70s and ‘80s to adopt new styles, but the years of stripe popularity was a time that is fondly remembered for welcoming everyone onto the same playing field…until of course new trends dominated the scene the next day. Stripes are a timeless pattern and have never truly gone out of style in today’s society. They still have a connotation of acting bold and daring. Stripes attract the eye and play with the eye; they will always stand out in a room filled with bold colours. It can be easily spotted in almost every year’s ready-to-wear collections from striped dresses to suit jackets. Vertical stripes are especially popular because it produces the illusion of a slimmer and taller body, which is why it is so popular on suit ties worn by business professionals which makes them appear a more powerful and have a distinctive presence. They are a very distinctive style (ex.Jack Skellington in Tim Burton’s Night Before Christmas) and is a fashion trend that connects us to a long history that our ancestors were a part of. Psychologists say that people who enjoy wearing stripes are “often good at multitasking, have a lot going on in their lives, and wear many hats” and considering the ever-changing, bustling times we live in, it’s probably a good thing that stripes are here to stay.